Dolphinariums and other whale husbandries played a key role in bycatch reduction research. The article portrays the important research by Prof Boris Culik from Germany. 300,000 whales and dolphins die each year as bycatch in nets around the world – a frighteningly high number. Modern and accredited zoos and aquariums have raised awareness on the topic of by-catch for years, and it is especially important to reputable institutions that hold whales. 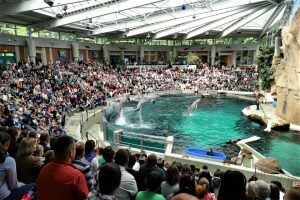 In the dolphinarium of Duisburg Zoo, for example, the educational presentation with bottlenose dolphins provides basic knowledge on the subject, because many visitors actually ask: Why don’t marine mammals simply swim or jump over the nets? 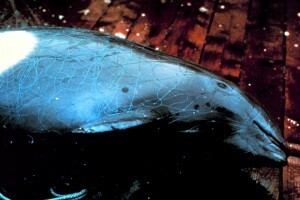 The answer is that harbor porpoises simply cannot see gill nets in nutrient-rich, murky coastal waters. Many imagine toothed whales as if they had their “sonar”, like a boat, constantly on, but in fact they often use it only when needed. The porpoise often does not, in the truest sense of the word, see any sign of an obstacle, simply because it cannot expect something like a net to be around. And the tragedy takes its course. At first, it was thought that dolphins and other whales just had to be kept away from nets, and so acoustic deterrents were used – so-called pingers. The problem is that nets are also food resources in the mostly over-fished seas and help marine mammals to find and capture fish. For whales and especially dolphins, a well-filled net can ultimately be a buffet, but the animals cannot see the dangers of it. And the net also helps them to cut off the escape route of prey. Thus, a “dinner bell” effect was described: The devices that should really deter may be used by the animals as an indicator of feed. They may even swim to nets just because of the pinger. So, this solution may fail because it does not solve the real problem of the animals: they still do not see the nets. In addition, a habituation effect to the noises of pingers was described scientifically. Other studies showed that in some cases, pingers were too strong a deterrent, excluding marine mammals from large areas of their habitat. Prof. Culik, therefore, took a different approach: he intended to raise the awareness of the animals. This means he aimed at encouraging porpoises to use their “sonar” near obstacles. This would enable them to perceive the nets and to avoid them in time, to avoid entanglement and ultimately death. He developed signal generators that emit artificial porpoise communication signals which stimulate the animals to actively echolocate. His website f3mt.net explains the research and results in detail. 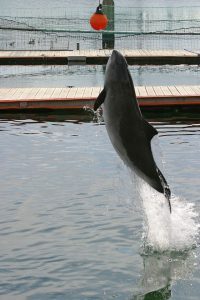 The approach of using synthetic communication signals was only possible because various whale species, including dolphins, live under the care of zoos and aquariums. Here, the basic research on echolocation took place, because, the “bio-sonar” can only be investigated in detail under controlled experimental arrangements. The research on animal communication and auditory reception of various sounds would have been completely impossible without these scientifically conducted husbandries. In the North and Baltic Seas, especially porpoises are affected by bycatch, which is why Boris Culik, who is based with his company F³ near Kiel in Northern Germany, was particularly concerned with this species. Unfortunately, very few harbor porpoises are maintained under human care in Europe, although they are so threatened in our seas. And because dolphins and porpoises communicate very differently with each other, only very few research results can be transmitted between species. The acknowledged researcher confirms that without dolphinariums his developments would never have been possible. Of particular importance were detailed Danish studies on the communication of harbor porpoises in the Fjord & Belt Center in Kerteminde, Denmark. Boris Culik built on these results to create a lifelike, synthetic communication signal that alerts porpoises to the nets. The new signal was first tested on porpoises in Kerteminde before trials were initiated in the field. Finally, the Thünen Institute for Baltic Sea Fisheries Rostock, a partner in the research project, tested it in professional commercial gillnet fisheries. The result was that the new technology achieves more than 70% by-catch reduction under realistic conditions. The new device was named “Porpoise PAL”. It has received wide press coverage and internationally, Boris Culik enjoys high recognition for its development. The wider PAL product range aims also at covering other areas. 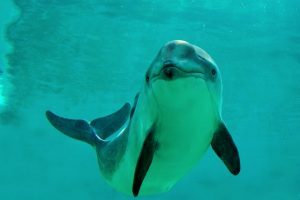 The 10 kHz PAL device is intended for small whales in general and aims at preventing noise damage due to construction sites or collision with obstacles in, for example, bottlenose dolphins. Large whales may be warned with the Whale-PAL from set nets and other hazards. The research on the effectiveness of this model is currently being carried out, for example, off the Canary Islands in studies on pilot whales. These new devices are meant to not adversely affect other species, to be inaudible to almost all species of fish, and to comply with both EU and US regulations. In the harbor porpoise, not only has the effectiveness in terms of by-catch prevention been demonstrated, but also the fact that fishery catches are not adversely affected. No fisherman has to fear a lower catch. The basic research from aquariums to the hearing of fish was an important piece in solving this issue. Another important piece to the puzzle was the research in zoos and aquariums on seals, because attraction by the synthetic harbor porpoise signals and theft of fish from the nets had to be avoided: The “dinner bell” effect is not only an issue with whales but also with sea lions and seals, who like to use pingers to find attractive food sources. Acoustic experiments by various research groups show that seals and seabirds cannot hear the porpoise PAL. This was confirmed in the field and in fishing trials with commercial fishermen using PAL: there was no evidence for attraction. The research on PAL shows how much science is needed for a small device like this and how important zoos and aquariums, and especially dolphinariums and other husbandries housing whales, were and are. More about the individual devices can be found in the product description on f3mt.net. More than 70% bycatch reduction is not enough for Boris Culik. He is currently working to further increase the by-catch avoidance rate and to adapt the signal to other porpoise populations outside the Baltic Sea. Unfortunately, the few porpoises maintained in the F & B Center in Kerteminde and Harderwijk in the Netherlands are currently the only populations he can conduct research. No doubt, we do not need a smaller number of cetaceans under human care, but sufficiently large populations in order to enable sustainable research in many areas. Bottlenose dolphins are doing great because professionals established a self-sustaining breeding population in human care that many researchers gratefully use to conduct research. For porpoises, however, it would be enormously useful for research to further expand existing populations. 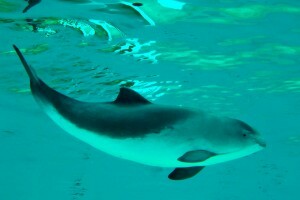 Currently, there is only one old harbor porpoise left at F&B in Kerteminde, Denmark and in the Netherlands, there are only a few porpoises (Amber [rescue, w], Siepy [rescue, w] and Ester [offspring, w] at the Dolfinarium in Harderwijk. Besides, Michael [rescue, m] and Dennis [rescue, m] live at Ecomare, as well as José [rescue, w] under the care of the Sea Mammal Research Company. It would also be beneficial in the future to maintain other threatened whale species in zoos and aquariums, such as the Amazon River Dolphin, which cannot be researched underwater in the wild due to the desolate water conditions in the Amazon. 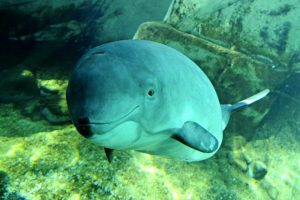 For the Yangtse river dolphin or Baiji, this comes unfortunately too late. And in the case of the Mexican vaquita, a lack of understanding on the peculiarities of this species has led to the recent failure of capturing and maintaining the last animals of this species. This would have been avoided if an attempt to maintain this species in human care been undertaken several decades ago. More than 80 of the most renowned scientists in this field support the proper husbandry of marine mammals under human care. It is now well established that animals will do very well if they are kept in accredited facilities that are state-of-the-art and constantly improving. The animals are willing to take part in the various, professionally accompanied research projects, and because of the training and occupational program, the research represents an enrichment. In every case, it’s definitely an enrichment for the conservation of their wild counterparts.